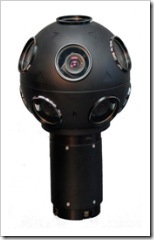 This is the 360 °digital camera head that captures still images for Google Maps – street view photographs that now available for San Francisco, New York, Las Vegas, Miami, and Denver. This Google Maps camera can be carried by hand or mounted over cars or airplanes. The camera shoot images at 11 different angles at a 100 megapixel resolution. Google says the imagery is “gathered by vehicles driving public property streets equipped with imaging technology”. So the next time you see some car or van around your house with this 11 lens camera mounted on the top, shut the door and the windows of your house if you are really worried about your privacy. Thankfully, they are shooting images for Google Street Maps only from the roads and not inside the building premises.